If you are determined to use eco-friendly products, Seventh Generation diapers might be an excellent addition to your baby care routine. They do not use any harmful chemicals in their products and the diapers do not contain any unnecessary lotions which will do wonders for sensitive baby skin, making it more resistant to rashes and irritation. Eco-friendly diapers which are safe for the environment. Unbleached material that is super soft on the skin. Very simple design which might leak a bit. Expensive when you buy smaller packages. Why Seventh Generation Diapers is a great eco-friendly choice for your family. Seventh Generation managed to make a name for themselves by creating and launching super healthy and green diapers. The first thing that you’ll notice once you get the diapers out of their pack is the fact that they are not sparkling white. This shouldn’t bother you at all because it is the confirmation of the company’s claim that they don’t use any bleach in the process of manufacturing. …super healthy and green diapers. With that said, we also have to mention that Seventh Generation Diapers are colored with a fully natural dye and they do not contain any petroleum either. They are also free of any fragrances, latex, PVC, etc. So if your primary goal is to turn your home into an environmentally friendly zone and you want to add more healthy products to your baby’s daily routine, these diapers might be exactly what you need right now. You will notice that there are some patterned options as well within this range and they are very eye-catching and colorful. If you are concerned about artificial dyes and color transfer, there is no need to worry with these diapers. They will not leave any stains on fabrics or the skin of your little one. The colors used on these designs are completely natural and safe. …free of any fragrances, latex, PVC, etc. Even though the material is not chemically treated, Seventh Generation Diapers are still super soft and will feel great on the skin. Since they do not contain any harmful lotions or chemicals, these diapers are ideal for babies who are very sensitive and prone to diaper rashes or redness. The natural materials will let the skin breathe and the air flow will be unobstructed. …ideal for babies who are very sensitive and prone to rashes or redness. It is also important to mention that the back elastic band is very firm and it will keep the diaper up allowing your little one to move freely. The side wings used for fastening the diaper are also stretchy and they fit surprisingly well! The positioning is just right and they will not cause any discomfort to your baby which is super important, especially if your little one is super active. Once you unfold Seventh Generation Diapers for the first time you might notice unfamiliar stripes on the inside. These lines are a part of the absorption layer and they are quite usual. Since these diapers are not bleached, they are more prominent and very visible. Seventh Generation offers seven different sizes to choose from; newborn up to size 6. Of course, you have to know the exact weight of your little one in order to find the right fit that will suit him or her perfectly. We also have to mention that newborn, one, and two sizes have a special extra layer of protection on the inside which provides faster absorption and improves the feeling of dryness. The design itself is fairly simple and the diapers are excellent for holding the liquid in, especially if you manage to get the sizing right. The size made for newborns also have a tiny cutout on the front upper part of the diaper that lets the umbilical cord heal properly. The diaper will not get in contact with it which is helpful. The range of products also offers an overnight option that has greater absorption power and allows your baby to feel calm and dry through their sleepy time. And once they get a bit older, you can try out Seventh Generation training pants as well. …seven different sizes to choose from; newborn up to size 6. Since these diapers are very simple in terms of design, getting them off and on is super easy. The side straps can be refastened as much as you want and they will still keep the diaper in place without restricting the movement of your baby. They do not look or feel bulky at all and you can quickly pull the clothes over them. Disposal is easy as well, especially because the side straps are so strong. Once you change your baby, make sure you pour the contents in a toilet. Then you can be sure that the remaining liquid will stay inside the diaper once you fold it up. The smell will not be super noticeable and there will be no extra cleaning work for you either. Even though Seventh Generation Diapers is not a premium brand, their diapers are not cheap, either. The best way you can save some money is to purchase a larger pack that has more than 100 diapers. The price tag and the number of diapers you’ll receive depend on the size you end up choosing. As an example, a pack containing 160 diapers in a size 1 retails for $48.00. That breaks down to about $0.30 per piece and placing it about mid-range for this kind of product. These diapers do come in different patterns as well. Of course, you can always choose a clean diaper without any designs, but colorful ones are still healthy and safe for the environment. As a matter of fact, the dye which is used in these drawings are completely lead-free and there are no harmful metals inside either. So you can add variety to the diapers without feeling worried about the ingredients. Buy right now on Amazon and get them for less than MSRP! (Check it Out). When it comes to the overall look, Seventh Generation diapers are very classic. They do have a couple of nice additions that make their diapers pretty unique but the bands and straps are placed in the standard locations and they fit really well. Your little one will be able to go through their day without feeling uncomfortable or restrained in any way. Unfortunately, there might be some leaks caused by the movement, especially in the area around the legs. The bands which are placed there in order to keep the situation in check are pretty good, but they do let go sometimes. It is completely expected because finding the diapers that never leak is almost impossible. Even though Seventh Generation Diapers promise twelve hours of wear, we definitely recommend that you change the diaper more often. Twelve hours is a long time and there is no need to test how much they can actually hold. It is clear that the diapers are powerful enough to hold plenty of liquid. The best way to prevent rashes and irritations is to keep your little one clean as much as you can. The absorption is super strong in these diapers and the protection liquid does its work quickly. Your baby will feel comfortable almost immediately which is really great. There shouldn’t be any accidental leaks during that time but yes, accidents do happen especially if your baby is super energetic and active throughout the day. Umbilical cut out for newborns. These diapers really do stand out from the rest because they are not bleached at all. They look a bit brownish and it adds to the whole natural feeling. The design is very simple and classic, and you can always go for a clean version that doesn’t feature any patterns. On the other hand, the range does have plenty of adorable design options and you can also choose some cute patterns that will make your baby very happy. 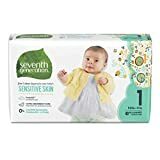 Seventh Generation diapers do have excellent absorption power and your baby will feel dry and clean almost immediately. They have elastic bands placed on the back and sides which will allow your little one to move as much as they want and when they want. The only downside is the area around the legs which might leak sometimes. Make sure you are keeping a close eye on that area and that you change the diaper in time. All in all, this is an excellent product that comes in a variety of sizes and you’ll definitely find the one that will fit your baby perfectly. Plus, they are very healthy and will help with skin sensitivity. So if you notice that your baby is feeling uncomfortable in a standard diaper, it might be time to try out a natural version that doesn’t have chemicals and lets the skin breathe.